There is more to getting a ticket than just getting a ticket. There is much more at stake than simply paying it too. Fines, driver’s license suspensions, surcharges, increased automobile insurance rates, and lost employment opportunities! Yep! Those can be some of the consequences of simply paying traffic citations. For those of you who have received traffic citations at some time in the past, you know that the whole process is a giant pain in the neck. Not only do you receive a large fine, usually several hundred dollars, but the problem must be dealt with and finalized. Either you make arrangements to pay the citation or try to fight it. Neither option is desirable but the problem won’t just go away and will be much worse by paying the ticket. Many people think that they are required to simply pay a traffic ticket; and they do just that. Unfortunately, simply paying traffic fines can make a bad situation much worse. Paying a fine is a plea of “Guilty” to a Class C misdemeanor, and results in a conviction of the charge. A conviction is very bad and can have significant and long-term consequences. Don't Go-It-Alone, Get Help from an Attorney! 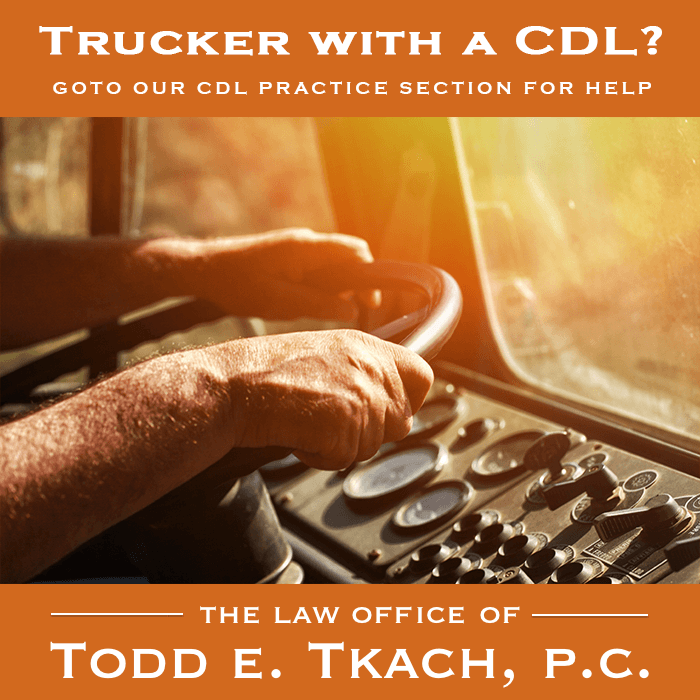 Before you simply pay a traffic citation, call attorney Todd E. Tkach. Find out your rights and options before simply paying a traffic citation and thereby incurring a criminal record. One phone call could save you hundreds of dollars and possibly avoid any criminal record. Don’t Go-It-Alone! Call now for your free consultation. Having a “conviction” means that you now have a “record.” A public record is made of all convictions, including convictions for Class C misdemeanors. Contrary to popular belief, a conviction stays on your record FOREVER, and remains available for anyone to see at any time. It’s like a bad tattoo that you can never get rid of. Your automobile insurance company will undoubtedly pull your driving record before agreeing to insure you. Moreover, they continue to check your record with each renewal of your policy. Convictions will raise your insurance rates! Especially for younger drivers. Perhaps more important, your record is available for any prospective employer to view. These days, many employers do a criminal history search on all applicants. Too many convictions and you may not be considered for the job. In fact, some employers won’t consider an applicant with only one conviction. Another consequence of “convictions” are the direct and immediate financial penalties. Sure, you have to pay a large fine amount, but the State may not be done with you yet. For many decades, the State of Texas has maintained a “point system,” for drivers. It assesses “points” for convictions for certain traffic violations. Too many points and your driver’s license gets suspended. The original purpose of the law seemed pure: keep track of unsafe drivers and suspend their drivers’ licenses if they accumulate too many “points.” Keep those bad drivers off the road, ……right? Well, yes. But a few years ago, it became clear that the State was using the “point system” as a source of revenue. With the passage of the “Driver Responsibility Program,” the Texas Department of Public Safety began assessing huge “surcharges” for convictions of traffic citations. I can hear the politicians now: “Sure, … let’s get those bad drivers off the road, but as long as we already have a law in place to track “points,” why not use it to “raise revenue?” (i.e. extract some more money from drivers). Surcharges are assessed in two ways: 1) Having six (6) or more Points; and/or 2) convictions for certain traffic violations. A Texas driver is charged two (2) points for most traffic violation convictions (3 points if a crash is involved). The “points” remain on a driver’s record for three (3) years. Importantly, although the “points” are removed after three (3) years, the conviction stays on the record forever. A yearly $100 surcharge is assessed for six (6) points; with another $25 surcharge for each additional point. The surcharge continues to be assessed as long as the points total six (6) or more. Convictions for certain traffic violations have automatic surcharges. For example, being convicted of Failure to Maintain Financial Responsibility (i.e. No Insurance) or driving while license suspended, each carry a $250.00 yearly surcharge for three (3) years ($750.00 total). Convictions for driving without a driver’s license results in a $100 annual surcharge for three (3) years. So, for a conviction for either driving without insurance or driving with a suspended license, you are indebted to the State of Texas for $750.00. Sure, you can pay it monthly, but pay it you must. The Texas Department of Public Safety has no sense of humor when it comes to collection of surcharges. Either pay them or your driver’s license will be immediately suspended. To make matters worse, in many cases the driver is unaware that his or her driver’s license has even been suspended. You are supposed to be notified by mail, but it seems that doesn’t always happen. Frequently, people are made aware for the first time that their driver’s license is suspended when they get pulled over for another traffic stop. Under that scenario, the driver may get a ticket for whatever violation just occurred, and for “driving while license invalid,” which, as indicated above, carries yet another $750.00 surcharge if convicted. It can be a vicious cycle of unending surcharges. Seek Legal Advice and Representation! The solution is: Don’t just pay a traffic ticket. It’s likely the worst thing you can do. Seek legal advice and hire a competent lawyer, who should be able to avoid a conviction. It could save you thousands of dollars and keep your record clean.